LOOKING FOR A NEW FURRY COMPANION? OPT TO ADOPT! Local shelters and rescue groups are full of adoptable cats and dogs -- all sizes, ages, and breeds -- in need of permanent, loving homes. Please visit Petfinder.com to search online for available adoptable pets in your area. Adopt, don't shop! As unwavering supporters of animal rescue and pet adoption, we do our part at Boofy's by fostering adoptable pets in-store as well as regularly hosting pet adoption events. Scroll down to see the adoptable pets currently in residence at Boofy's. Visit our EVENTS page to view upcoming adoption clinics and other pet-related events we are hosting. At Boofy's we like to help cats and kittens finish their days of being homeless. By partnering with organizations such as F.A.T. Katz and Second Chance Animal Rescue, we provide a loving foster home where felines can develop their minds and bodies while waiting to meet their forever families. Students in the program learn such valuable skills as proper feline nutrition, creative problem solving, basic science, melodramatic reactions, canine management, how to slay a peacock feather, MMA fighting techniques, and kitty yoga. Here are the adoptable cats currently in residence at Boofy's Feline Finishing School! Stop by anytime during regular store hours to meet them. Interested in adopting? Download an adoption application here. Keep up with the kitties of Boofy's Feline Finishing School by following their page on Facebook! 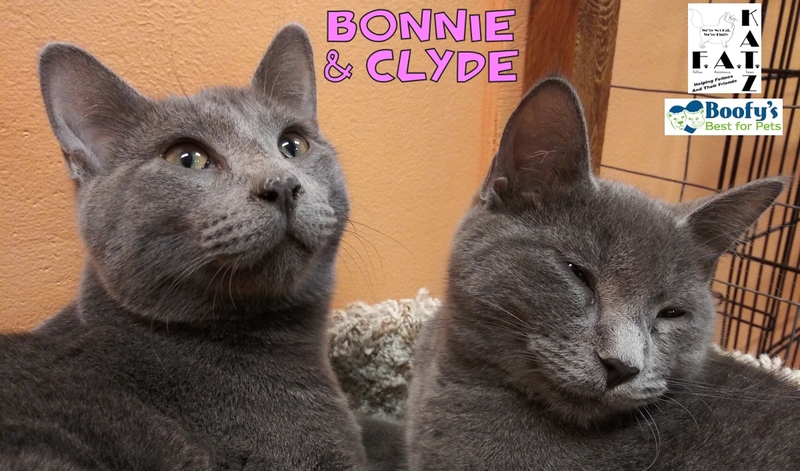 BONNIE & CLYDE (born September 2018) don't rob banks, but they will steal your heart!. These stunning blue kittens can be a bit shy at first, but when they warm up they'll have a lot to talk to you about. They enjoy playing with feather toys and laser pointers, and they like having high perches and hidey-holes. Bonnie would love to be adopted with her older foster "brother" Kismet (see below). 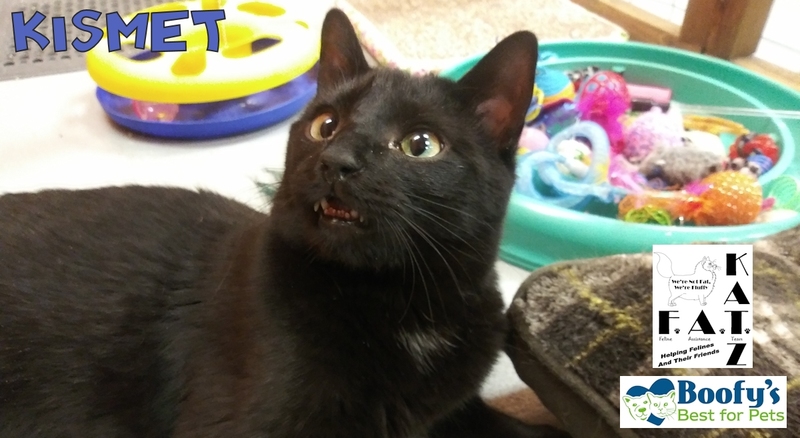 KISMET (born March 2018) is a handsome black panther with an adorable underbite. He is an absolute fiend for feather toys! He does well with other cats, including his brother Nero, and has developed a special relationship with his younger foster "sister" Bonnie (see above). NERO (born March 2018) is the quintessential gentle giant. 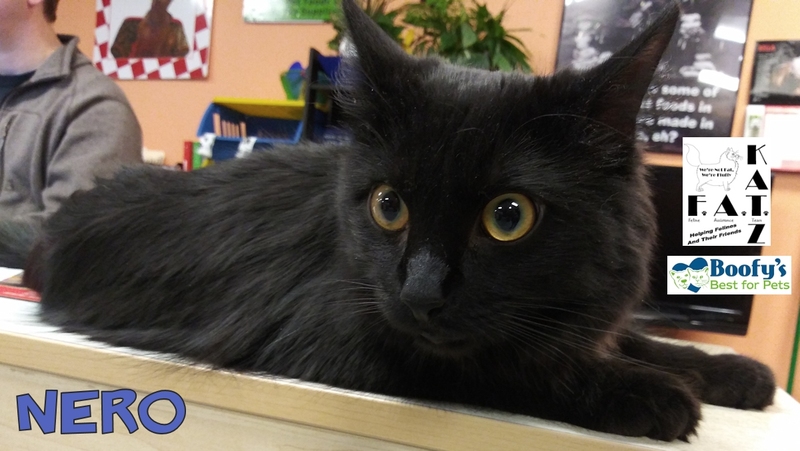 This long-haired boy is very sweet and chill, gets along with everyone, and does great on a leash. He's a big fan of catnip and silver vine and would be a wonderful addition to any home. Luigi attended Boofy's Feline Finishing School and was adopted from F.A.T. Katz in August 2018! Look at him run on his exercise wheel! Sometimes when you stop by Boofy's you may find a canine visitor hanging out with us. No, we don't offer boarding services, but we do serve as a temporary foster for our animal rescue partners. Foster homes are the backbone of animal rescue, and we encourage you to become a foster for one of the many animal shelters and rescues in our area. In addition to providing love, care, and socialization, foster homes provide TIME for adoptable pets to find their forever families. Simply put, fostering saves lives.